Star Trek, often referred to as Star Trek: The Original Series to distinguish it the latter shows it launched, is one of the all-time classic science fiction series. Telling the story of Captain Kirk and the starship Enterprise, the show paints a picture of a galaxy-faring human race three centuries in the future. Over the course of its mission, the Enterprise will explore the galaxy, defend the Federation of Planets from various villains and meet new species. 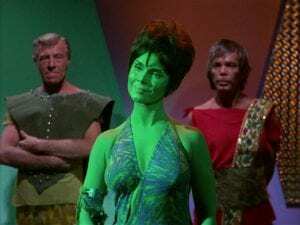 Today, even among its fans, the show is known as much for its campy acting and cheesy effects as it is for its ground-breaking vision for humanity. Rarely subtle with its symbolism or its morals, Star Trek was a show that was meant to teach lessons in an approachable way. However, plagiarism wasn’t a topic that came up a great deal in the 23rd century. Still, a brief exchange in the episode Whom Gods Destroy (Season 3 Episode 14) not only brings plagiarism to the forefront, but exposes a great deal about one of the series most important and best-remembered characters. 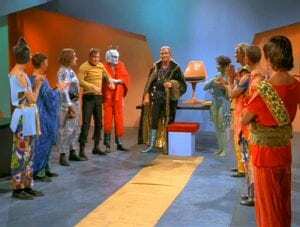 The episode begins with Kirk and Spock beaming down the planet of Elba II, an asylum intended to house the most dangerous of the mentally ill. The planet itself has a poisonous atmosphere and the asylum is further protected by a forcefield that blocks transporters and orbital phaser fire. The goal is to prevent inmates from escaping and it does a very good job. Kirk and Spock are there to deliver new medicine that is believed to be a cure for severe mental illness. Once they beam down, they are greeted by Dr. Cory, the governor the institution. Dr. Cory gives the pair a brief tour of the facility though a female inmate named Marta warns them that Dr. Cory isn’t who he appears. However, the warning comes too late as Dr. Cory morphs into Garth of Izar, the facilities newest (and most famous) inmate. Known as a brilliant tactician, Garth was a fleet captain who was instrumental in the Federation’s victory at the battle of Axanar. However, after that victory he was badly injured in an accident and healed by beings on the planet Antos IV. As part his recovery, he was gifted with the ability to morph his physical shaping, giving him the ability to impersonate anyone. Unfortunately, that accident also left him quite insane. After he ordered his crew to destroy the very creatures who healed him, the crew mutinied and he was locked in the asylum. But with control of the asylum, Garth hatched a plan for escape, seeking to impersonate Kirk and take over the Enterprise. That plan was foiled though when Garth was unable to give the countersign to be beamed aboard the Enterprise. Garth then turns his attention to his captives in a bid to learn the countersign. First he offers them a lavish dinner in a bid to woo them. During this dinner, Garth asks Marta to recite some of her poetry. She then begins reciting Sonnet 18 by William Shakespeare. This prompts a heated exchange between Garth and Marta. Garth, however, calms down quickly and asks Marta to dance for the “guests” and she obliges. He then tries other tactics to get the countersign including threatening Kirk. It’s during one of those threats that Marta starts another one of “her” poems and reads the first stanza A.E. Housman’s XIX “In midnights of November”. This time, the plagiarism is not detected by Garth or, if it is, he doesn’t call her out on it. For the rest of the episode Garth attempts to get either Kirk or Spock to give him the countersign. He tries various methods including torture, having Marta seduce Kirk and threatening them by demonstrating a new explosive he invented (which is done by taking Marta outside in the poison air and blowing her up). 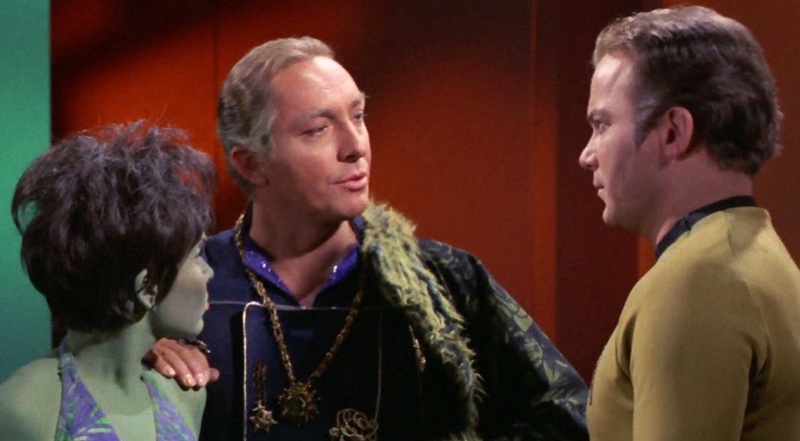 In the end, all of his attempts fail, including impersonating Kirk to fool Spock, and Garth is overpowered. The episode ends with Garth getting the treatment they were originally there to deliver and seemingly coming out of his madness. The plagiarism in the story couldn’t be much more clear cut if it tried. Marta proudly proclaims that she will be reading her poetry and then proceeds to read the works of two well-known earth poets. However, it’s the reaction to the plagiarism that’s especially interesting, especially when one looks at the characters involved. First, there’s Marta. When she’s caught plagiarizing she doesn’t attempt to deny or hide it. She admits that Shakespeare wrote the original piece but simply protests that it doesn’t change that she wrote it last night. It’s a highly illogical argument but it’s not an uncommon one among plagiarists. After all, she probably did physically write it last night, just that she copied it from Shakespeare rather than coming up with it herself. So either Marta feels the physical act of writing something is enough to make it her own or this is simply part of her insanity. That is left open to interpretation. Either way, she genuinely feels that she’s in the right as she doesn’t back down until Garth threatens physical violence and, even with that threat, commits another act of plagiarism just minutes later. But then there is Garth, who is the really interesting case study. Garth becomes completely outraged by the plagiarism, snapping almost to the point of violence. However, the second time Marta does it, there’s no reaction. Either Garth didn’t notice the second plagiarism, which is likely given the lesser-known source (pretty much everyone is more obscure than Shakespeare), or he didn’t care and both reactions were the product of his madness. While that’s open to interpretation, it seems the former is more likely. After all, Garth seemed personally offended by the plagiarism and his anger at personal affronts is consistent and is in character for someone who considers himself “Master of the Universe”. This is proof that Garth is not quite as intelligent and as knowledgeable as he presents himself, a subtle way to expose another character flaw. But it’s the fact that Garth gets so angry that’s interesting. Garth is, quite literally, a shape shifter. His greatest asset is his ability to pretend to be other people. All of his success up to this point comes from his ability to impersonate others. Yet, when Marta does the literary equivalent, Garth explodes. Is this simple madness? Or is it that Garth’s shapeshifting has made him insecure that others could pull similar tricks over him? It’s hard to say. But watching a shapeshifting alien get angry over plagiarism is a stinging piece of hypocrisy and, most likely, a deeper look at what makes Garth and his madness tick. 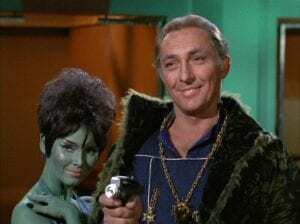 If you’re a reader of this site, you’ve almost certainly read about Garth of Izar and his exploits, even if you aren’t a Star Trek fan. The reason is that Garth was the proposed protagonist the fan film Axanar. That film, which was crowdfunded to the tune of $1 million, was famously sued by Paramount and CBS for copyright infringement. Though the lawsuit was settled, it changed fan fiction, in particular Star Trek fan fiction, forever. Still, after rewatching this episode, it’s easy to see why the team behind Axanar picked Garth and his famous battle as the subject of a film. Garth of Izar, even in madness, was an interesting character and his hypocrisy about plagiarism was just part of that picture. All in all, the plagiarism wasn’t a major part of the story but it was an interesting way to reveal more about two different characters. It created a point of conflict and gave both of them a chance to show part of their beliefs. It was a small exchange that said a lot more about Garth, an obscure character that would go on to inspire some of the series most passionate fans.